itch.io Community » Game Development » Release Announcements · Replied to leafo in Language learning game Lingotopia is out now! Not the right place for this praise really, but I'm very grateful for your Kickstarter and Steam integration. You've made this whole process of making/releasing a game so much easier. itch.io Community » Game Development » Release Announcements · Created a new topic Language learning game Lingotopia is out now! 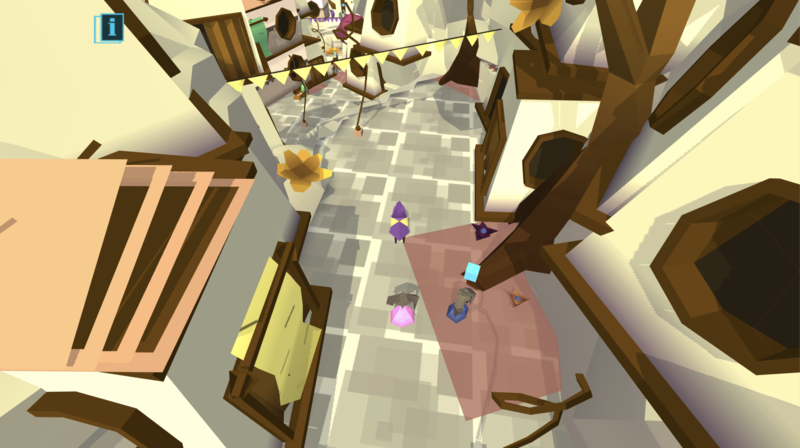 Lingotopia is a language learning game about being lost in a city where you don't speak the language. Learn Chinese, French, German, Japanese, Russian, Spanish and more! You play a little girl shipwrecked on the shores of a strange island. In order to get back home you'll need to explore the island and talk to its inhabitants. Sadly, no one speaks your language! You'll have to learn words one at a time to decipher what these strange creatures are saying. Explore a lovingly handcrafted city. 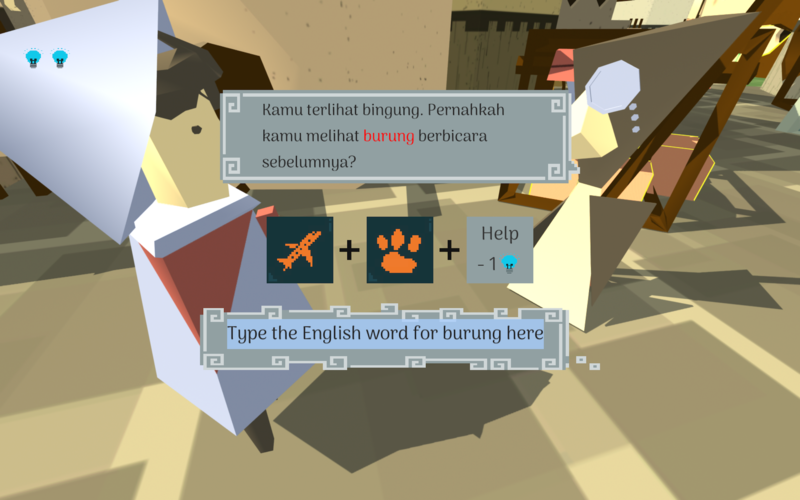 Click on objects in the environment and your guide will teach you the word for them. Learn words by talking to the city's inhabitants. Voice recordings by native speakers teach you the correct pronunciation. Learning a language with a different script? Toggle between the romanised and native script at any time. I've worked on the game for over and a half years and am very anxious and excited to release it out into the wild now. I'll stick around so please shout if you have any questions. Awesome! Thanks so much Jupiter! Thanks for playing! There definitely still are several issues remaining and I'll do my best to fix those issues soon! Thanks a lot for your feedback and kind words! I'll work hard on including that in future versions of the game. The people you can talk to are definitely too few and far between at the moment! And good idea with the guide, I'd had an idea like that a while ago but lost sight of it along the way. Will see what I can come up with! Save game support will only be in the game as of the next update. Hi, thanks for the feedback! I agree with you 100%. These are issues that I've tackled and should be much improved when I release the next update of the game ( 1-2 months from now). awesome! Thank you so much! That's super helpful. Thanks! The game is being made in Unity3D, with the modelling being done in Houdini. I'm not going to distribute it using a free software license, since I'd like to release it commercially when it's done. itch.io Community » Game Development » Release Announcements · Created a new topic New Lingotopia Demo out now! I've just released a new demo to my language learning game Lingotopia. It's a game that simulates the feeling of being lost in a city where you don't speak the language. 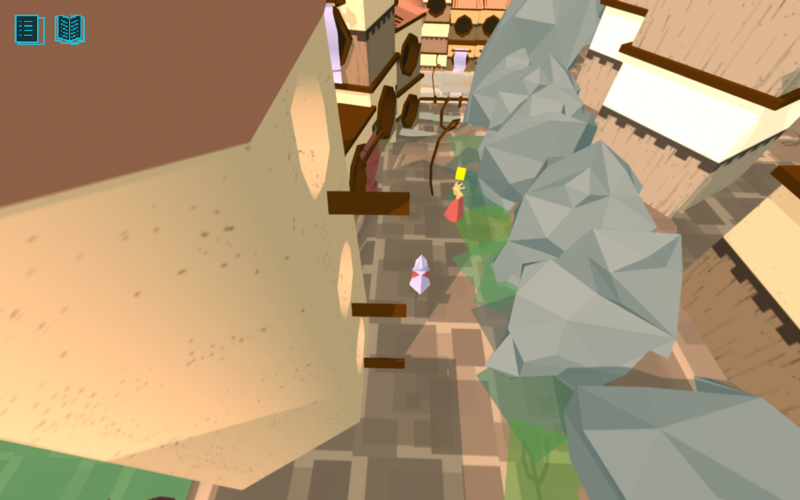 You can explore and entire city district of Lingotopia and by clicking on items and chatting with its inhabitants you learn words. The more words you know, the more you can begin to understand what's being said and feel at home in this strange city. I've been working on this game since the beginning of the year and am going to use this demo to get feedback, more translations and perhaps even get the interest of a big famous publisher who'll shower me with money. Fingers crossed! Yay! I'm working on it. I'll release new demos like this every few months. Each time with a few more words to learn. Thanks for playing! Hi! I've just released a webgl version of the very first prototype for my language learning game, Lingotopia. In it, you play a young girl lost in a strange city full of anthropomorphic animals ( who speak a real language, such as French or Swedish). The city mentioned above isn't in the game yet, right now there's of the few planned dialogue minigames that teach you a word of a language. It's short, but if learning a language is something you might be interested in, then please give it a try! If you'd be interested in expanding the amount of languages available in the game for the next demo (which will have more mechanics and words to learn then I'd be super grateful! German and English are covered but all other additions are welcome. Hopefully I'll get a few more downloads than the 11 I've had on itch.io so far. I did send out my press releases in advance this time (2 weeks) and touch arcade already wrote a short article announcing the release date. So I'm crossing fingers. I'll post here again with some download numbers in a month or so, because I think a comparison between itch.io (few users, but better visibility) and the mobile storefronts (billions of users, no visibility) could be interesting. But then it'll be time to start a new thread for some new game (finally)! Well, the press release was quite concise and pointed the reader to the website and presskit. I think if one were to just link to a website it would seem a bit lazy. Good feedback regarding the trailer. I think its difficult to make a turn based game seem exciting and I probably should have used a faster pace. I kept it slow to make sure everyone would be able read the text and understand eveything. itch.io Community » Game Development » Release Announcements · Posted in One Show Only, my detective card game is out now! itch.io Community » Game Development » Release Announcements · Replied to mrpete in One Show Only, my detective card game is out now! And the game is now available on itch.io! yay! It'd be great if you'd give it a try. Right now I'm getting less downloads than expected. Zero to be exact :'( But maybe that'll change and I'll post here again in a week or two, since some of you might be interested in knowing how many downloads a dev with no name can get on itch. itch.io Community » Game Development » Release Announcements · Created a new topic One Show Only, my detective card game is out now! I've been working on a little game called One Show Only for the past 9 months or so. And I just released it on itch! Hope you have fun! Happy sleuthing! Okay, I'm nearly done with the game, there are just some bugs to fix and optimizations to do and since I had to capture some footage in order to hand my game in for IndieCade I ended up making a little trailer. I plan on releasing the game on itch.io first and then mobile a month or two later. I've always been interested in seeing how games sell on itch.io so I'll share my numbers here then. The two aspects of the game that still need a lot of work at the moment are the interface and the fact that the card game and the dialogue system don't complement each other as far as the gameplay is concerned. The UI contains a lot of visual noise at the moment, so by removing ui elements until they are required, the player can more easily see what they should interact with. An example of this are the text bubbles on the left hand side. They are now only displayed after you have asked your first question and they begin to fill with dialogue. To further simplify the UI I have changed the text displayed on the players cards. Whereas they used to display the first three words of that question, I.e "where were you…" they now simply say "Question 1" or 2,3 etc. The important thing is that one can still differentiate them. But the text no longer grabs your attention when the most important part of the cards UI are the arrows showing their movement options. This will reward players who take the time to read the dialogue and make the process of deciding which person to interrogate next less random. I've been working on the graphics recently (excuse the gif compression) and adding some more content. I now have all the dialogue I need for the game and its no longer quite as short. So there's just some bugfixing and usability stuff left to do! There's a wonderful game development in Berlin every two months called Talk and Play. I showed my game there last week and my to-do list on Trello shot up from 20 something items to nearly sixty. +People like the art style. -As the game gives you no feedback on cards that reach the top, but do not unlock other cards; There was little sense of accomplishment if you did not happen to use the right card against the right person. I've made some changes in order to help people understand the mechanics. A simple change was to add a hand sprite behind the cards in the player's hand and to move those cards closer together than the cards on the grid. This makes it clear that the game does not take place on a 3x4 grid, but on a 3x3 grid, the extra row on the bottom is to show you what cards you can place on the grid. Additionally, arrows on the card light up depending on what column they are placed on. This helps make the connection between the arrows on cards and the directions they can move in. The other issue (no sense of accomplishment when you bring a -wrong- card to the top, is a little harder to address. I want to add a counter to the top of the card game that gets +1 for every card you bring to the top. In order to place to harder cards, this number needs to be increased. Then I want to reduce the amount of cards that don't unlock further cards at the beginning of the game. This way there's less chance of a player having no sense of progression in the first few interrogations. I jazzed up the website for the game and sent off a little press announcement, which got me two features so far. The main benefit of this (apart from feeling encouraged), is that a handful of strangers signed up to get an email on release. Okay, thanks for making it this far! The ability to walk around the circus grounds in my game had begun to feel a bit unnecessary. It was boring, not touch friendly, and made it a chore to talk to a person on the other sides of the circus grounds. So I took it out! One can now swipe left or right to go to an npc and click on them to start the card game. And this makes the game much better. yay! The downside of this is that it makes the already short game even shorter. But I'll add more questions to unlock to make up for that. I also made a (terrible and ugly) website for the game if anyone's interested in taking a look. The card game is used in the game to interrogate witnesses, cards represent questions and the aim is to move your cards higher up on the grid to unlock get more information. -It takes place on a 3x3 grid. -Each turn the player can place either a new card, or move an already placed card one row higher. -The arrows at the top of the cards represent their movement options, so if the left arrow is vertical, that card can move straight up when on the left column. If the center arrow is diagonal, the card can move diagonally upwards when in the center column. -Each card has a unique combination of movement directions. -Placing a card on top of an enemy's card removes it from play and vice versa. Bringing a card to the top row can unlock new cards. So hopefully that makes sense... As far as progression is concerned the player starts off with cards with a lot of movement options, as they're easier to use. While the enemies at the beginning of the game have cards that can only ever move in one direction per column. Later on enemies get stronger cards, with multiple movement directions per column, making them less predictable. There are still some design issues however, the card game is both too easy, as well as too short! It takes a few turns to for the enemy to have placed enough cards to be a threat and by then the player has enough time to bring at least one card to the top row without any opposition. And while one could program smarter AI to combat this (currently the enemies move are completely random), it'd be difficult to find the correct difficulty with that approach. So my plan is to have certain cards, that can only be placed after enough other cards have reached the top row. This would prolong the length of the card game by forcing the player to place cards they wouldn't otherwise place and gives the enemy a chance to place some cards of their own. Okay, that's that! If anyone has any feedback regarding the card game, as far as graphics or design are concerned, I'd be very interested in hearing it. Thanks for reading! One Show Only is a detective game where the player solves a case by interrogating suspects. The interrogation takes place by playing a card game against the witnesses, where cards represent questions and your skill in playing those cards determines the answers you get. It's set in a circus, as a trapeze artist died under 'mysterious circumstances' during the final act. So the player can walk around the circus to talk to the various suspects. I'll post an update about the card game next and explain the mechanics in more detail as well as the design issues I currently have with it.